This 12 Gauge shell by Remington features a one ounce Slugger rifled slug. It is designed to improve the slug’s accuracy by 25% over other comparable slugs, and with its 1,760 fps muzzle velocity it shoots 25% flatter than other rifled slugs as well. This slug is ideal for hunting for deer in areas that only allow smoothbore shotguns to do the job, as it will travel significantly less far than a rifle’s bullet would. Its rifling is designed not to provide gyroscopic stabilization, but rather to decrease the contact that it makes with the shotgun’s bore and correct for any manufacturing irregularities that may have occurred in the factory. Remington’s legacy of excellence began when their founder built his first flintlock rifle in 1816. Over the course of the past two centuries they have mastered their craft, and always offer a good product regardless of their customer’s needs. 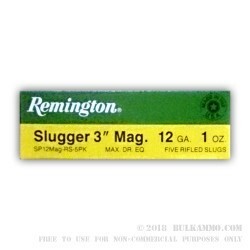 Q: Are these Remington sluggers lead or steel shot? A: Hello Robert, The Remington Slugger is a lead Rifled slug.